Anindya Dutta is a brave man. There have been at least nine full length books devoted to the 1948 Australian tour of England and, given the plethora of great players on both sides, the series has featured in many other books as well. The rush to publication began as soon as the tour ended with men who had seen all of the play putting their accounts into print. Andy Flanagan, Denzil Batchelor, John Kay and John Arlott all contributed their interpretation of the events they had seen. In addition the great ‘Tiger’ O’Reilly wrote Cricket Conquest and, most important of all, Jack Fingleton published one of the best of all tour books, Brightly Fades The Don. In the twenty first century Australian writers have contributed more books. Peter Allen published The Invincibles in 2001, and bulky accounts later appeared from Roland Perry (Bradman’s Invincibles) and Malcolm Knox (Bradman’s War). In the circumstances is there anything that can be added to the story by a modern writer based in India? To be fair to Anindya Dutta he hasn’t made a bad fist of the job. What shines through above all is his fascination with a series of Test matches that were played long before he was born and in a country far away from his own. He quotes a lot from Knox’s book, but has clearly read those of Arlott, O’Reilly and Fingleton as well. Also on his reading list was Bradman’s autobiography, A Farewell to Cricket, and he has dug deep into the many words that have been written by, on behalf of or about Len Hutton. The result is an account that anyone unfamiliar with this great series will enjoy reading and which has been written with some imagination. I had, for example, when reading about Bradman’s famous dismissal for nought at the Oval in the final Test, expected to read, as I so often have, the famous words that Arlott uttered whilst on commentary. It would have been the obvious thing to do, but Dutta instead makes a much better call and chooses a humorous aside from a member of each side, from the man who bowled Bradman, Eric Hollies, for the home side, and from Sid Barnes for Australia. We Are The Invincibles is self-published via Amazon, and as a result lacks a bit of polish. The scorecards, from Cricketarchive, could have been set out in a manner rather easier on the eye and the photographs, although a decent selection, are not terribly well reproduced. There are a few grammatical grumbles, and a couple of slightly irritating proof reading errors. At one point Bill Edrich becomes cousin John*, and the Yorkshire medium fast bowler Alec Coxon is renamed Coxton*. I was also amused at Dutta’s suggestion that during the Old Trafford Test Barnes was ‘injured while building’*, rather than telling the story of how he came to grief when fielding dangerously close to the bat. 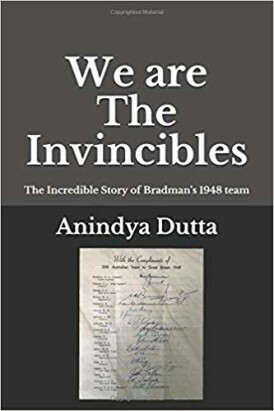 All in all I would normally describe We Are The Invincibles as a book for the casual reader, rather than the connoisseur, however Dutta does have a trick up his sleeve. His fellow countryman Kersi Meher Homji, resident in Sydney since 1970, was not in England in 1948 either. He did however get to see some of the Invincibles play later and, more importantly, in later life had dealings with Bradman, Keith Miller, Neil Harvey and Ernie Toshack. The guest essay from him that closes the book is a most enjoyable one. *In the internet age the author has been able to remove these typos in order that purchasers will not be troubled by them, and to enable reviewers to own a very rare and collectable variant! There is no sign yet of a UK release for the latest anthology of Gideon Haigh's recent work, but surely there will be before too long?